The Chicago Bears will open their season against the Green Bay Packers on Sept. 9, according to the NFL. 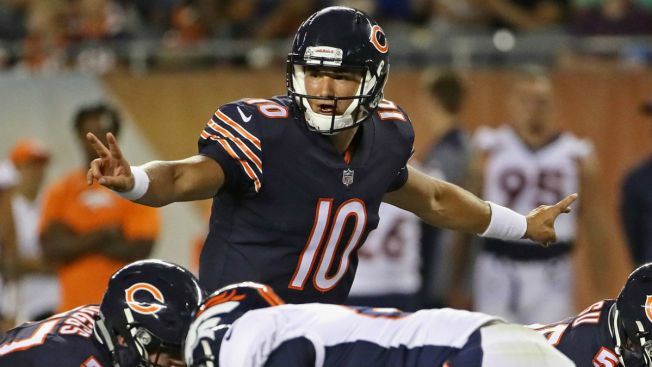 The Bears announced their full 2018 schedule on Thursday, and it features some tough opposition. The Seattle Seahawks and New England Patriots will both travel to Soldier Field to play the Bears, and the Bears will play road games against the Miami Dolphins and Buffalo Bills. Week 1: Sept. 9 vs. Green Bay Packers 7:20 p.m.
Week 2: Sept. 17 vs. Seattle Seahawks 7:15 p.m.
Week 3: Sept. 23 at Arizona Cardinals 3:25 p.m.
Week 4: Sept. 30 vs. Tampa Bay Buccaneers 12 p.m.
Week 6: Oct. 14 at Miami Dolphins 12 p.m.
Week 7: Oct. 21 vs. New England Patriots 12 p.m.
Week 8: Oct. 28 vs. New York Jets 12 p.m.
Week 9: Nov. 4 at Buffalo Bills 12 p.m.
Week 10: Nov. 11 vs. Detroit Lions 12 p.m.
Week 11: Nov. 18 vs. Minnesota Vikings 12 p.m.
Week 12: Nov. 22 at Detroit Lions 11:30 a.m.
Week 13: Dec. 2 at New York Giants 12 p.m.
Week 14: Dec. 9 vs. Los Angeles Rams 12 p.m.
Week 15: Dec. 16 vs. Green Bay Packers 12 p.m.
Week 16: Dec. 23 at San Francisco 49’ers 3:05 p.m.
Week 17: Dec. 30 at Minnesota Vikings 12 p.m. The Bears will also play five preseason games, including the NFL’s Hall of Fame game against the Baltimore Ravens.